A lovely St Monans holiday cottage, full of charm and character and ideally located near the harbour. 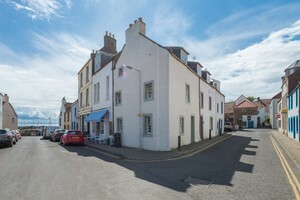 Stay in this 1 bedroom holiday rental property in St Monans that sleeps 2 (+2), Bath towels, Linen included. This charming one-bedroom terraced house is in a great location in St Monans, just yards from the harbour. The house can sleep two in the double bedroom but also has a double sofa bed available in the lounge. St Monans is a pretty little fishing village in Fife, Scotland. Just a 5-minute drive from towns Elie and Pittenweem. Only 10 minutes from Anstruther and less than half an hour from St Andrews. It’s a beautiful place to explore. And as it’s on the Fife Coastal Path, there are stunning walks right on the doorstep. A white terraced house on West Street in St Monans, Fife. There is a comfortable and well-equipped dining kitchen on the ground floor. A lovely double bedroom and bathroom on the first floor. And finally, a large sitting room on the top floor, with three sofas (one of which can be used as a sofa bed). The wooden beams and quirky shape of the house add to its appeal, as do the numerous artworks on the walls. A sign of the thriving art community in the lovely East Neuk of Fife. St Monans is about an hour’s drive from Edinburgh and Dundee Airports. You can also reach the village by bus from Edinburgh and St Andrews. Local area The scenic fishing village of St Monans is in an area renowned for its coastal walks, quiet beaches and numerous golf courses. It has lovely wynds, colourful houses and of course, the fishing harbour. The 'Auld Kirk' is a particularly striking church, positioned majestically on the coastline and first built in the 14th Century. Just a short walk from the house and overlooking the harbour is an award-winning restaurant, Craig Millar @ 16 West End. At the other side of the harbour you can find the East Pier Smokehouse, with equally lovely views across the water. The seaside town of Elie is only 2 miles away, with beautiful sandy beaches as well as a great selection of shops and restaurants. 2 miles in the other direction is Pittenweem, the most active fishing village in the East Neuk and home to the celebrated Pittenweem Arts Festival in August. Our St Monans holiday cottage is within easy reach of Edinburgh (1hr30), St Andrews (30mins), Dundee (40mins), Perth (45mins) and Stirling (1h30m). St Monans is one of a series of pretty little fishing villages along this coast and the house is only yards from the harbour. It's ideal for two and would be OK for four, although being on three levels with steep stairs would not suit someone with mobility problems. This St. Monan's house is a secluded, beautiful gem set amongst the quaint, wonderful seaside towns of the East Neuk of Fife. I don't want to tell people how fantastic it is as we want to be able to book to come back! If you get a chance, visit The Cocoa House in Pittenweem and The Adamson in St. Andrews - a wonderful Michelin star restaurant for good prices! If you book here, you will not be disappointed. We had a really great holiday, loved the house, very quirky, lovely artwork and exactly like the photos. St. Monans is a great place to go with a young family (we have a 1 and a 4 year old) and a good base for all nearby beaches too. We're hoping to come back soon! A home away from home. We had a very comfortable stay. The house is well appointed and tastefully decorated with real art / tasteful prints with a seaside theme. We stayed in the winter and it was really cosy. There is a general store across the road supplying fresh food, veg, bread & newspapers. St Monans is a beautiful fishing village with great walks along the coast to Elie and Anstruther. We would be more than happy to stay there again. The house is warm and cosy and in a great location a stone's throw from the harbour - idea for accessing the Fife Coastal Pathway. We walked to Anstruther via Pitenweem one day and to Elie the next. Perfect weather and lovely scenery. The Smoke House at the harbour a has rooftop seating area and sells locally caught sea food: I can recommend the Tempura Prawns! We didn't meet our host but she furnished the house cozily, tastefully and with great attention to detail, which made us feel at home straight away. She also provided detailed information about where to go & what to do. The locals were so friendly and warm that we felt instantly welcome. A beautiful house with lovely features filled with artwork by local artists. A very relaxing and comfortable place to relax, unwind and see the local points of interest in the East Neuk. Very close to the harbour and next to a fantastic coffee shop, The Diving Ganet. I couldn't have enjoyed my stay more and would recommend this property. I will definitely be returning! Great cottage in St.Monans and perfect for exploring the beautiful east neuk of Fife. The flat is well laid out, well equipped with some quirky little areas and wonderful local art adorning every wall. Lorna was very responsive to every request for information and the welcome pack leaves you with very few questions to ask. The shop across the road is well stocked with very friendly staff. A walk (or even run) along the coastal path to the windmill is recommended, as is the path to Elie with a stop off in the wonderful Ardross Farm Shop. The local hotel has some excellent beer and is very welcoming also. We will definitely be coming back to stay here again. Really enjoyed my stay here. Laid out over 3 floors, it felt very spacious. Bed was superbly comfy, very modern bathroom, lovely décor throughout.